One of my favorite accessories for Fall 2015 in menswear is the shawl. For marketing to men, it could be thought of as an oversized scarf. It adds drama to the simplest of ensembles and is practical as well as versitile. On the street I’ve seen young men wearing sport blankets wrapped around themselves like these models of the runway. Much like the poncho, it’s a basic item that I can see becoming a standard in men’s wardrobes. 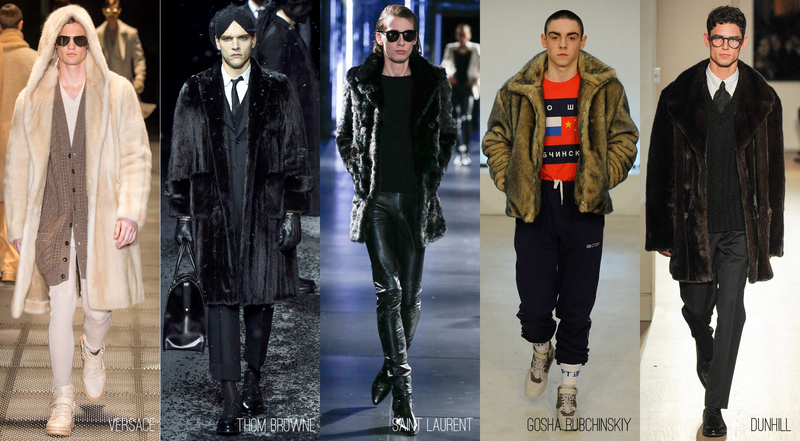 The biggest trend I noticed was the use of fur for menswear in the fall 2015 runway shows. It was seen mixed with other fabrics like in Antonio Marras‘ patterned suit with fox fur and Belstaff‘s hooded coat with leather. There was long voluptuous styles at Lanvin and Roberto Cavalli and mink at Thom Browne, Versace, and Dunhill. Fur came mixed to create pattern and stripes at Marni, Sibling, and Anna Sui. 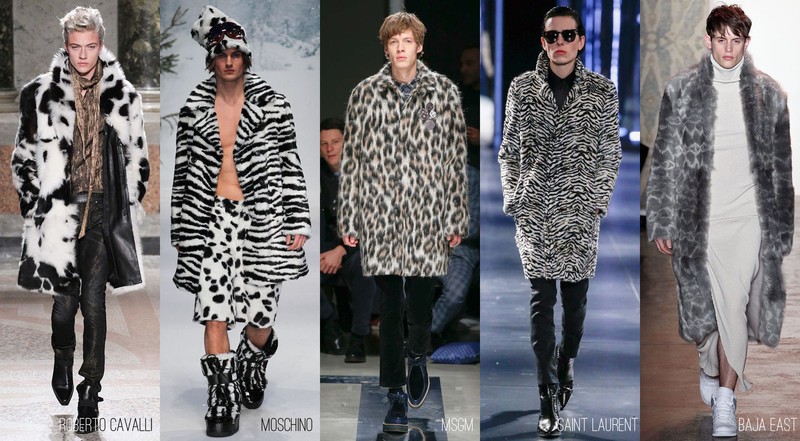 Animal patterns were there too at Saint Laurent, MSGM, and Moschino. 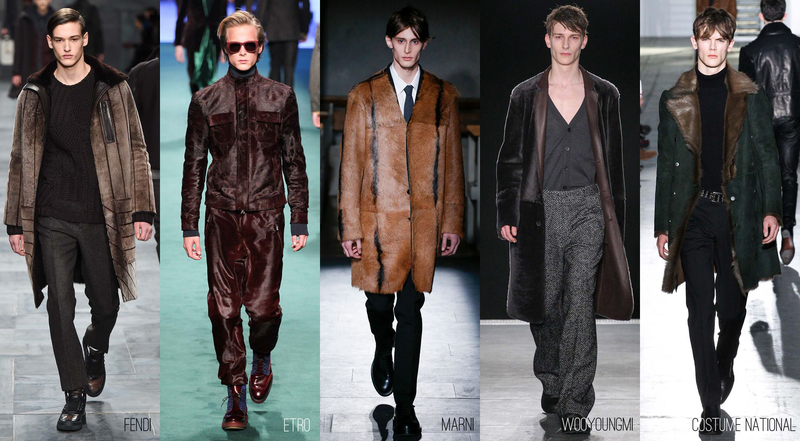 Short shaved fur was featured in coats at Etro, Wooyoungmi, and Fendi. Plush coats of fur walked down the runways of Burberry Prorsum, Lacoste, and J.W. Anderson. Sportier lengths of fur were shown at Giorgio Armani, Louis Vuitton, and Moncler Gamme Bleu. And for those “vested” in fur, sleeveless styles came from Costume National, Engineered Garments, and D Squared. Overall matching pattern & prints from head to toe could be seen in casual and suited looks for fall 2015 menswear. The range of pattern was everywhere: from floral, to graphic, to photographic, abstract, and geometric. There was also a mix or sometimes clash of pattern in one ensemble. Jeremy Scott paired stripes with cute baby prints. Vivienne Westwood mixed her plaids in different sizes and angles, while Walter Van Beirendonck clashed his with florals and embellishments. Calvin Klein was monochromatic in his mix and Dries Van Noten paired complimentary stripes with florals. 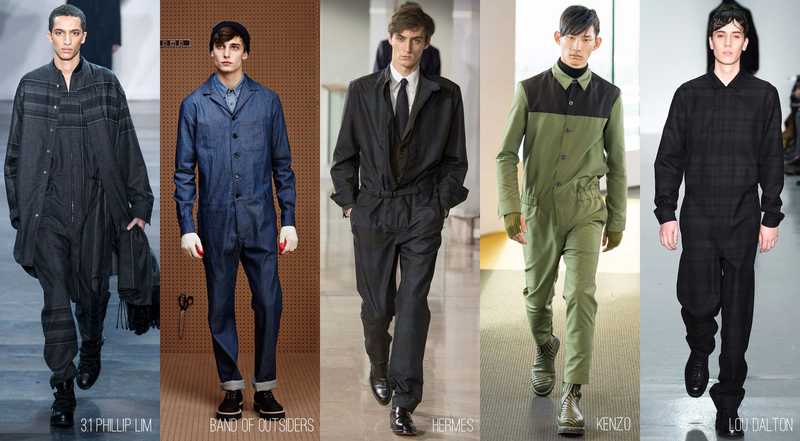 The best way to describe this trend of menswear is not to confuse it with women’s clothing. They’re not dresses but extended shirts in some cases. Worn with pants they become more masculine. Worn without pants they can look like skirts but that might be difficult to market. So what do we call these styles for men? My choice is “tunics”. This has been trending in menswear for several seasons by more and more designers. The rules for gender are changing and so are the styles. In most instances these tunics still feel masculine styled athletically or with suit pieces. Rick Owens, Telfar, Hood By Air, and Oduer push these tunics to a new level of “dressing” that offer men what women have been enjoying in ease and comfort. 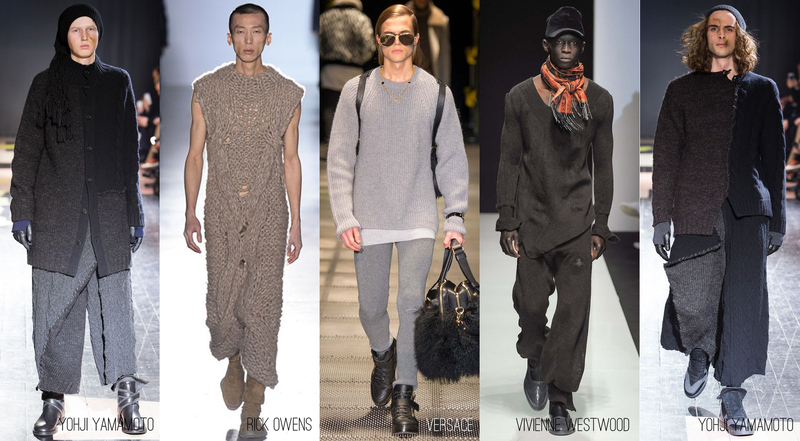 All-over knit dressing for men was seen on the runways of Yohji Yamamoto, Rick Owens, Versace and Vivienne Westwood. It’s a natural progression to casual men’s dressing that took it to a designer taste level. Sweaters took on shine in the collections of Maison Margiela and James Theseus Buck. Kenzo showed a strong group of pullovers. Acne Studios, Sibling and Walter Van Beirendonck go graphic with strong colors and patterns. Jumpsuits have moved from utilitarian workwear to casual and dressed-up looks. Band Of Outsiders keeps it basic in denim. Topman references race car pit crews. Hermès and Lou Dalton used suiting materials to create hybrids. It’s a great look and easy way to get dressed quickly … until you have to use the restroom. 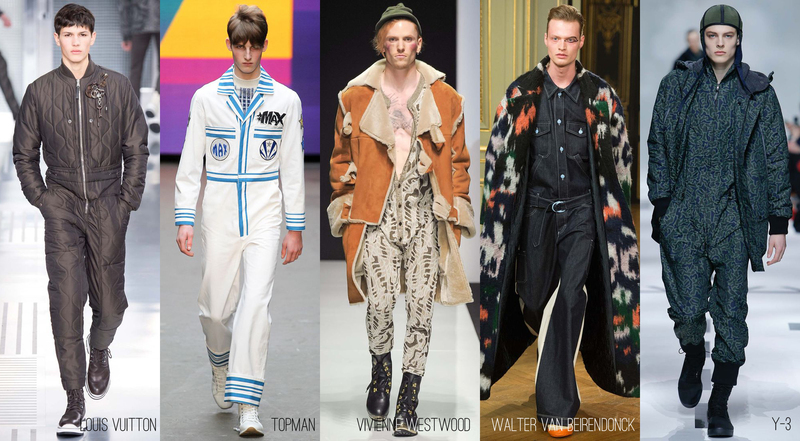 Ponchos offer a bohemian vibe to a man’s wardrobe. They are casual and utterly comfortable. Throwing one over your clothing immediately adds a dash of style. Calvin Klein, Kenzo, and Off-White offer hooded versions for rain protection. Sacai, Skingraft, and Topman modernize the traditional shape in knits and fabric.